The Starbucks Corporation, which is credited with bringing premium coffee into the American mainstream, died this week as a parody of its former self, and following a long battle with acute Kumbaya-ism. The coffee chain was 47. Founded in 1971, the Seattle-based coffee company began as a supplier of premium roasted coffee and coffee equipment. In 1982, Howard Schultz was hired as director of retail operations and marketing, and after briefly leaving the company to start a chain of Italian-style coffee cafés, Schultz eventually acquired Starbucks in 1987; pivoting the company to its current business model. By the time the company went public five years later, it operated 165 stores in the U.S. and Canada. At the time of its death, Starbucks operated more than 25,000 stores worldwide. Though its rapid growth is attributable to Schultz’s extraordinary business acumen and vision in the marketplace, Schultz also is responsible for the chain’s untimely demise. An obsessed patron of the liberal occult (such as the belief in an invisible and unknowable force called “unconscious bias”), Schultz relentlessly injected his personal, left-wing agenda into the DNA of the company. While this strategy might at first have been innocuous, perhaps even commendable, including such tactics as offering full health benefits to all employees, and investing into numerous philanthropic endeavors, Schultz inevitably fell into a devastating cycle of political correctness, taking down with him the coffee empire he built. Precipitating factors to its fall started years ago with Starbucks’ experimentation in rabid liberalism, but a post-mortem suggests an incident occurring in April to be the pivotal moment in which its Kumbaya disease went from curable, to terminal. In this incident, the manager of a Philadelphia Starbucks store made a terrible lapse in judgment by calling police on two African-American patrons who asked to use the restroom while waiting on a third member of their group to arrive. The men reportedly declined to purchase any beverages while they waited, which violated a “loose” store policy for restroom use. The men refused to leave, saying they were there to meet their friend, a real estate developer, who was on the way. All this led the manager to call police – a decision Starbucks (rightfully) said never should have been made. Rather than responding to the incident with an immediate apology and disciplining the manager, it is now believed to be Schultz’s addiction to political correctness that drove him to overreact in such a manner that set into motion events that would be the company’s ultimate undoing. 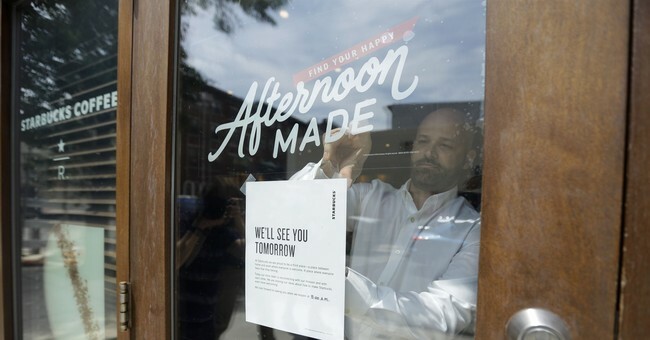 On Tuesday, 8,000 Starbucks stores and offices across the United States closed (at no small expense) for training on race relations and “unconscious bias” – the aforementioned term for racism, which individuals do not know lives within them. Though experts warned this type of employee re-education, if it even makes a lasting difference on a largely transient workforce, “has mixed effects” and “can even backfire,” Schultz pressed forward in spite of these potential consequences. Also found to be a contributing factor to its death, in the days preceding this training, Starbucks, at Schultz’s direction, announced a change to its store policy, henceforth allowing anyone to loiter on its property and use its restroom facilities regardless of whether they make a purchase. “We don't want anyone at Starbucks to feel as if we are not giving access to you to the bathroom because you are less than; we want you to be more than,” Schultz feverishly stated in what had become a regular manner of mixing nonsensical liberal gobbledygook with major business policies. With investors already concerned by ominous indicators like the chain’s dwindling afternoon sales, when according to reports coffee consumption rises at this time, Schultz’s liberal delusions did little to quell the fears that he had lost touch with reality. It seems Starbucks’ remaining customers, who had not already abandoned “corporate coffee” in favor of local stores on the same liberal principles ironically possessed by Schultz, were also unmoved by the decision to turn their favorite places for meetings or to study, into homeless encampments because of a moral duty to society. With its lifeforce drained, and failing to be replenished by Schultz’s empty vision of making people “more thans” by giving them restroom keys, maybe-probably-but-not-really making store employees less racist through one-day training classes, and stripping managers of their autonomy to run individual stores as needed, the brand we once knew as Starbucks coffee quietly expired. Condolences may be sent to @Starbucks via social media in the form of hashtags about lost causes.